This happens to be my favorite seafood dish. 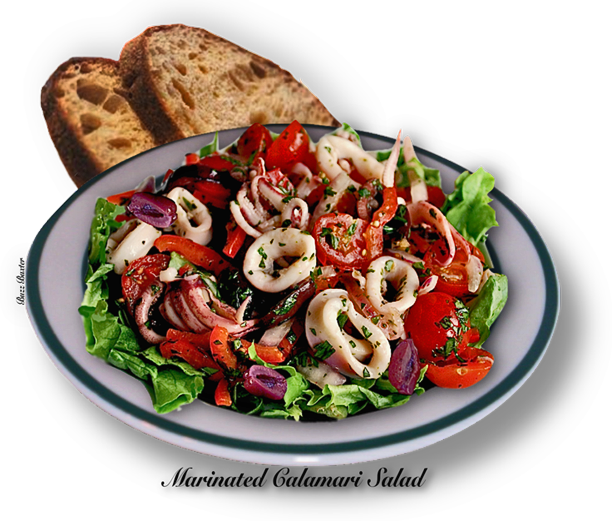 It brings back fond memories of hanging out at Fisherman's Wharf in San Francisco and having a marinated calamari salad at Alioto's Grotto #9. Having a glass of Chianti and lots of San Francisco Sour Dough bread to sop up the marinade. It really doesn't get any better than that. When I was in the U.S. Coast Guard in the early 1950's, Squid was only used as fish bait and usually it was free for the asking at fishing docks and bait shops along the California Coast. It now sells for 4 to 6 dollars a pound. and cut bodies into 1/4 - 1/3” wide rings. calamari  is cool, drain and pat dry. 3. In a small bowl, whisk together lemon juice, vinegar, oil, garlic salt and pepper.